In the 1790s, the federal government authorized two arsenals for the United States. One would be in Springfield, Massachusetts. 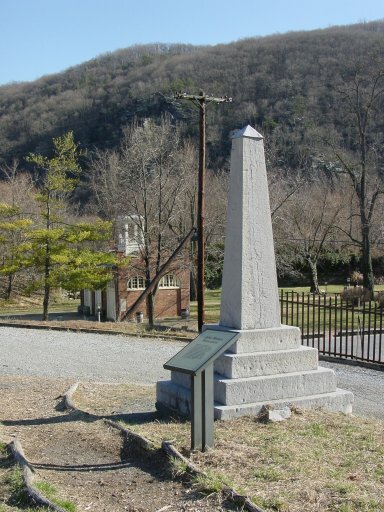 The other was to be at Harpers Ferry, Virginia - a site selected by President Washington. 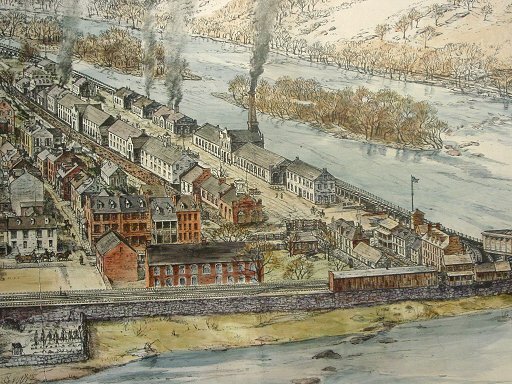 In 1799, construction of the Virginia facility began, and in 1801 the Harpers Ferry arsenal began turning out muskets. 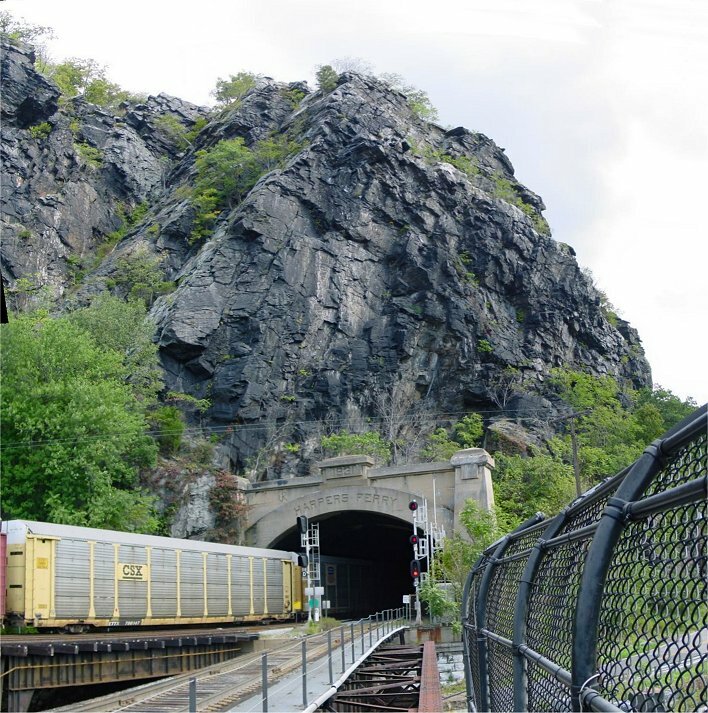 At the confluence of the Shenandoah and Potomac Rivers, where the Potomac cuts through the Blue Ridge, Harpers Ferry was, and is, a transportation choke point with access to water power. Small arms manufacture was still largely a craft. Mass production of small arms along the whole production process was first tried in France during their Revolution, but there were many problems, most especially labor problems. Mass production of small arms was possible in America, or at least MORE possible, because America had no previous small arms industry of any size. So there were few gunmakers who felt the need to protect their craft methods. There were still some labor problems, but fewer than there had been in France. 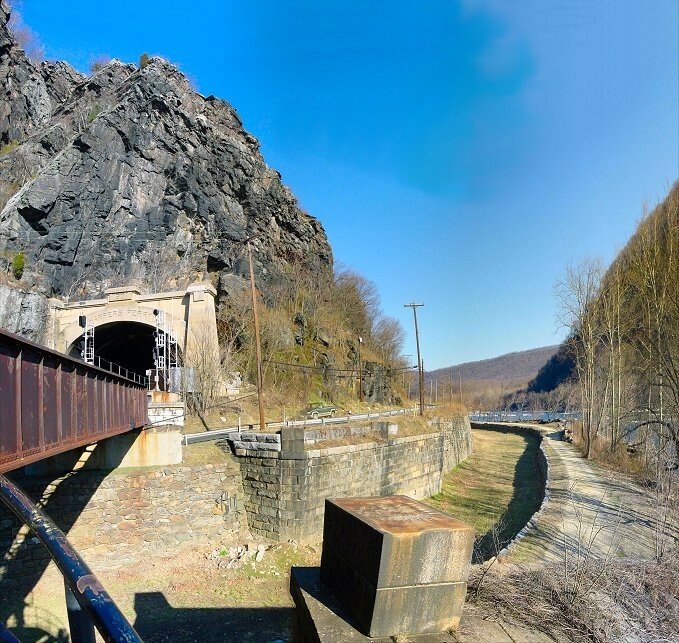 Flooding was a problem at Harpers Ferry, and water power proved to be generally inadequate. 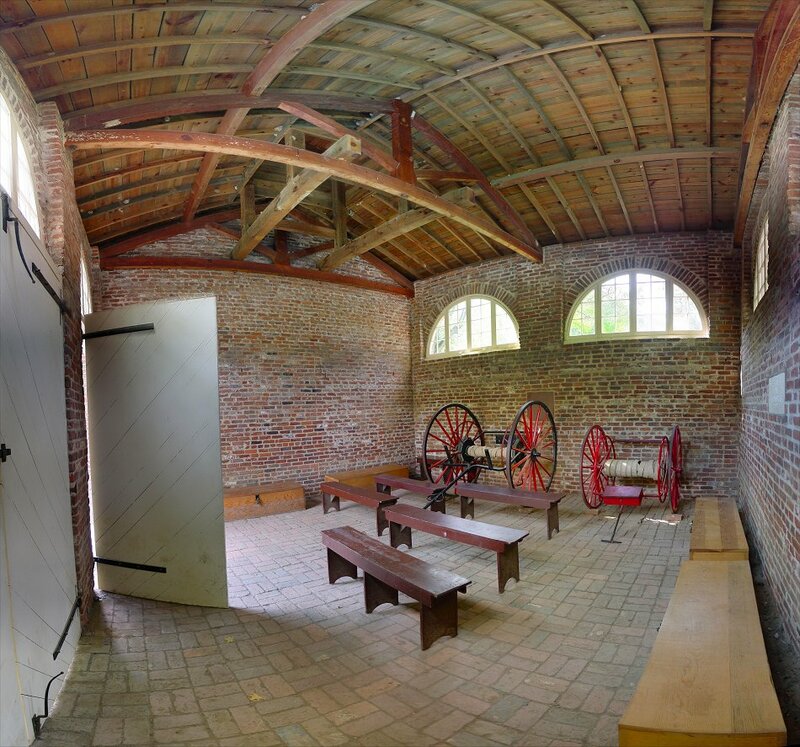 The facility suffered from neglect until the 1840s and 1850s when the place was renovated. 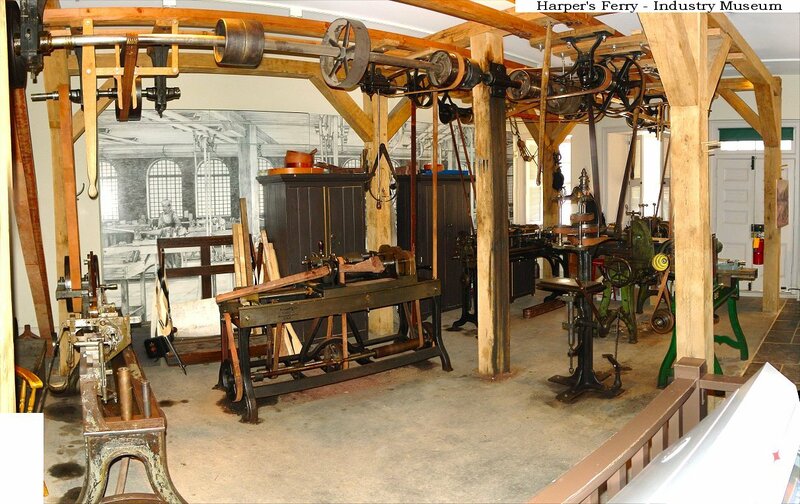 Other industries were attracted by Harpers Ferry, including the factory for Hall's flintlock breechloader. The Hall breechloader was patented in 1811, and it continued to impress even into the Civil War. On the left of the pan the Potomac cuts through the Blue Ridge, flowing from the right of the picture. The smaller river is the Shenandoah, with the town of Harpers Ferry between the two. 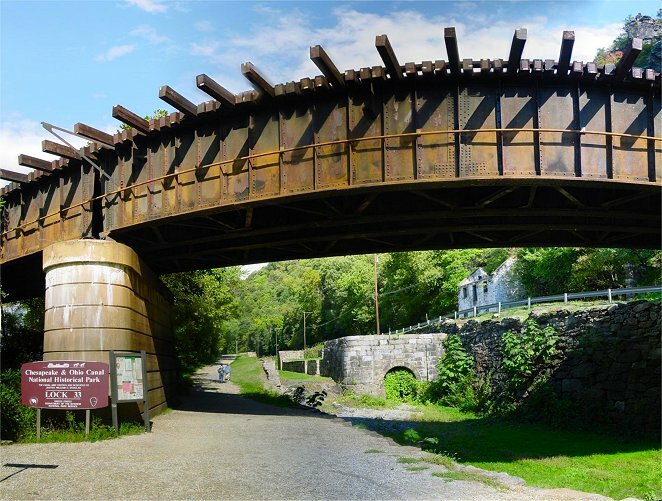 You can see abutments for two old railroad bridges. The Armory was in the area roughly between the two modern bridges. On the lower left you can see the remains of the Chesapeake and Ohio Canal. From a vantage point a little to the right, you can see the canal again on lower right of the pan. The town is better visible in this shot. At the end of the left bridge, the track splits. Just above the left portion of track is the old armory firehouse, or John Brown's Fort, which has been moved to its present location to save it from railroad construction at its original site. It is the only remaining building from the armory. The steeple marks St. Peter's Catholic Church. Camp Hill overlooks the town, and Bolivar Heights, the scene of the main defenses in 1862, are visible on the horizon beyond town. The Shenandoah River on the left enters the Potomac. Virginius and Hall's Islands are up the Shenandoah River. As you can see the railroad bridges are now different. The canal is on lower right corner. The armory is on the right side of town. This is a better view of the Armory on the Potomac side of town. This is looking down the armory from the Shenandoah River side. The firehouse is in the center. This NPS exhibit, the Museum of Industry, shows the various machines and processes which went into production of small arms. Power was furnished from overhead belts. A pistol stock maker is on the left of the panorama and a musket stock making machine is prominent to left of center. Other machines include a barrel borer, among other things. A video describes the machines, but if you can, try to take in a live demonstration when you visit. The photo on the right shows the stock making machine. 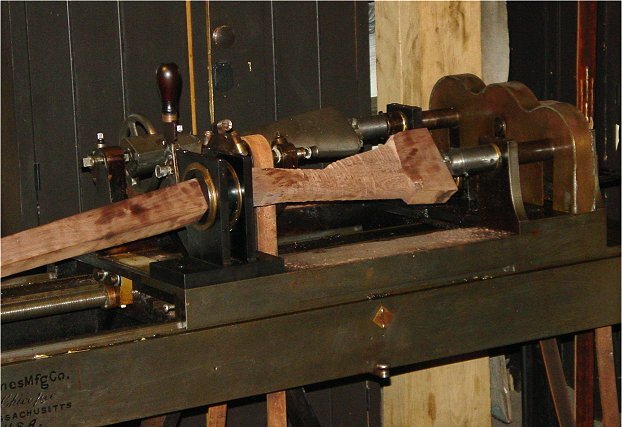 A device rolls over the metal pattern which then causes cuts to be made on the piece of wood next to it until it is shaped like the pattern. 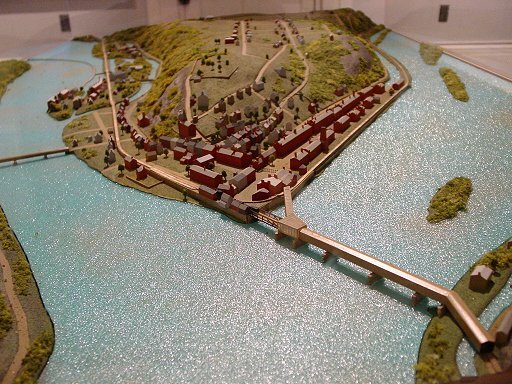 This pan from near a modern railroad crossing over the Potomac also show the area of the destroyed armory. The railroad embankment on the right cuts right through the armory site. Atop the railroad embankment is a monument on the original location of the firehouse. The firehouse is visible here in the background. The webmaster isn't the only person who has photographed the fire house. Yes, it's true. Many people do the same thing - some are more dedicated than others. In 1859, the mentally ill abolitionist terrorist John Brown took a break from his regularly scheduled killings in Kansas for a much bigger project, freeing all the slaves. To do this, he planned to arm the slaves. To arm the slaves, he needed to get guns - plenty of guns. Do you see where we're going with this? 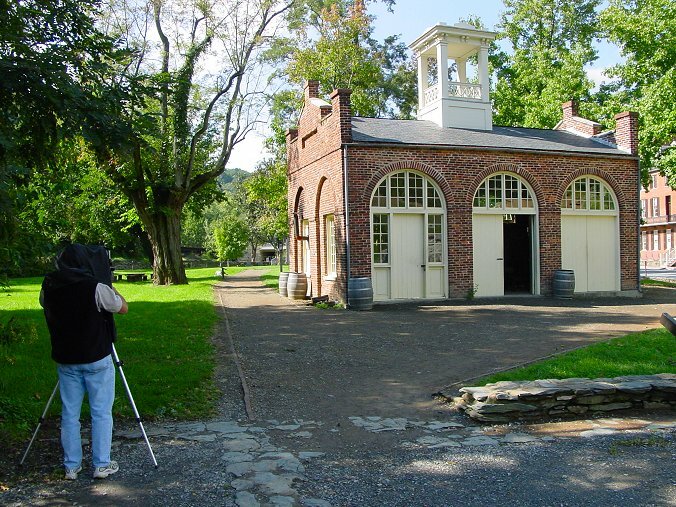 As money was a problem, theft was the procurement method of choice, and the armory at Harpers Ferry was the logical place to steal from. The slave rebellion went slowly - very slowly. 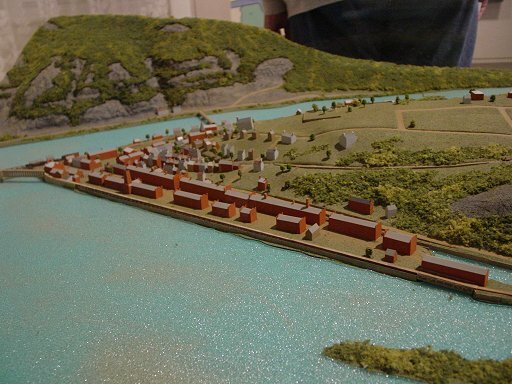 In fact, it didn't get beyond Harpers Ferry. He only had 21 people with him to begin with, so there was little reasonable hope for success. John Brown's little band ended up holed up in the firehouse. 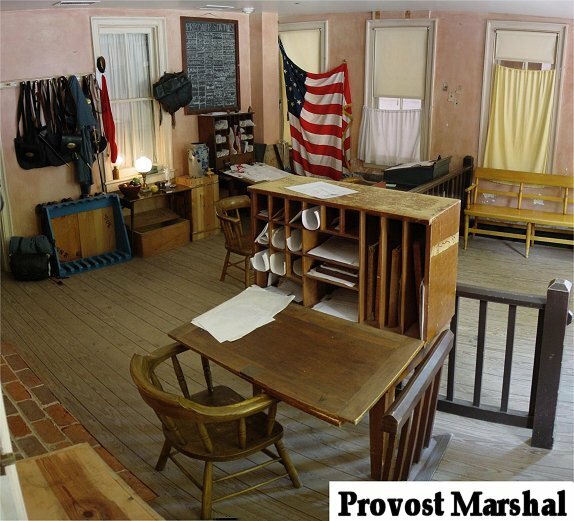 A detachment of Marines under an army colonel, Robert E Lee, busted into the firehouse and arrested Brown. Clearly Brown was guilty of something serious. Exactly what was the question. The Commonwealth of Virginia found him guilty of treason against the state - to the puzzlement of people ever since. Brown was hanged in nearby Charles Town in what now appears to be someone's yard. Despite the embarrassing failure of the raid, the South took John Brown's attempt seriously, and sectional tensions rose. White Southerners increasingly armed themselves and organized military units. War broke out in 1861, attributable in part to John Brown's raid. The Confederates occupied the arsenal and shipped much of the weapons making equipment to Richmond. 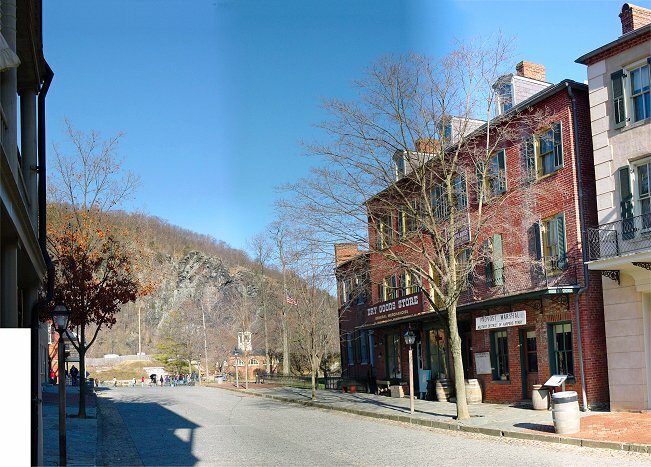 Surrounded by hills and mountains, the Harpers Ferry was difficult to hold, but the Union army occupied the place for much of the war. In September 1862, Stonewall Jackson captured the town and its garrison after a brief fight.